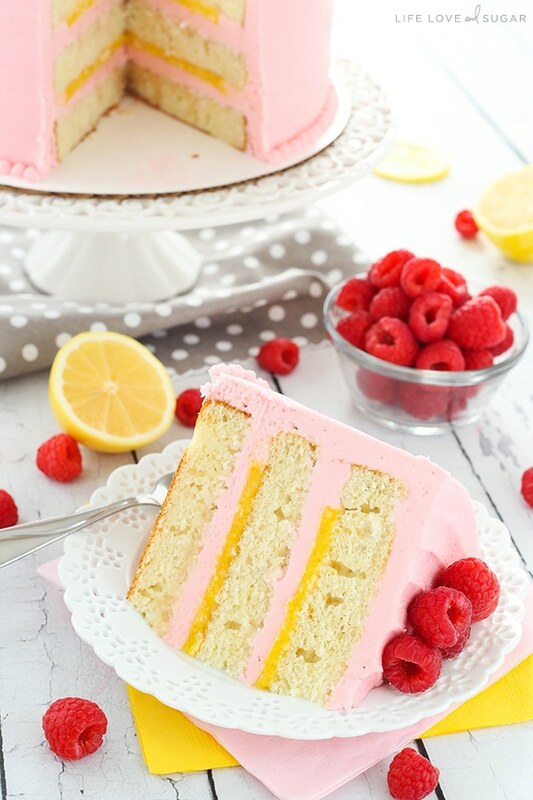 This Lemon Raspberry Layer Cake has moist, light layers of lemon cake, lemon curd filling and a raspberry frosting. It’s decorated with buttercream, lemon slices and a few blossom flowers for a cake that’s perfect for summer! Lemon raspberry is one of my favorite flavor combinations this time of year and always reminds me of my grandmother. 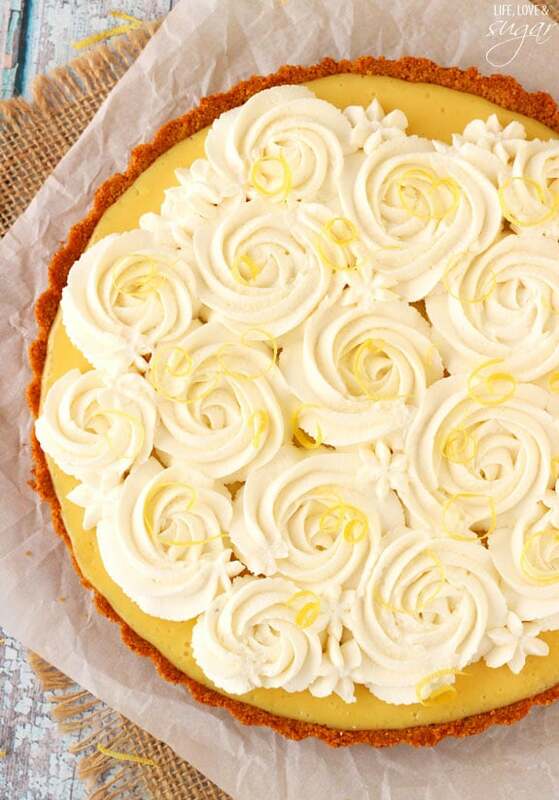 There are two things she’s always loved – cake with lots of icing and lemon. It’s a love of two things that we share. Instead of buttercream flowers on this cake though, I decided to go a bit simpler. There are buttercream swirls, some lemon slices and raspberries and a few fondant blossoms that are super easy to make. All of it sits on top of a little swirl that you make with an offset spatula. Relatively easy to do, but creates a great look. Inside the cake, you’ve got a moist lemon cake to start. It’s light, fluffy and pretty straightforward to make. Just be sure to not skimp on the creaming of the butter and sugar – always an important step. 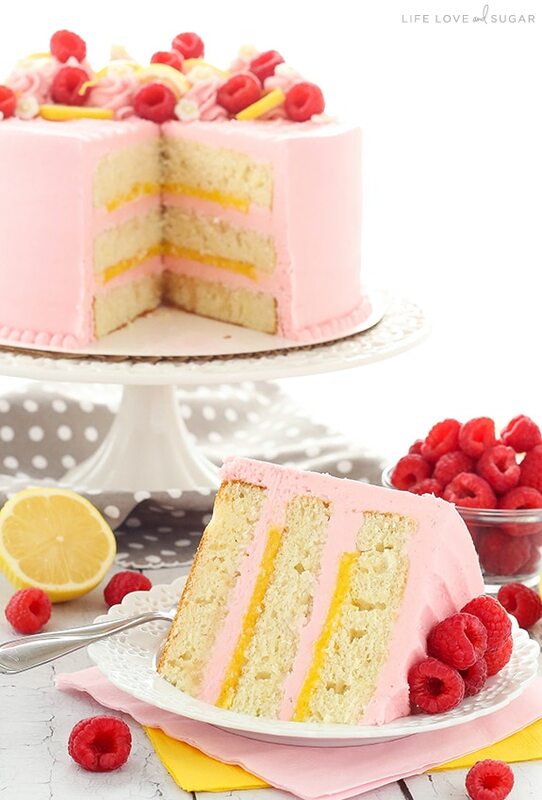 Between the layers of cake is a lovely lemon curd and raspberry buttercream. Sweet and tart all in two beautiful layers. 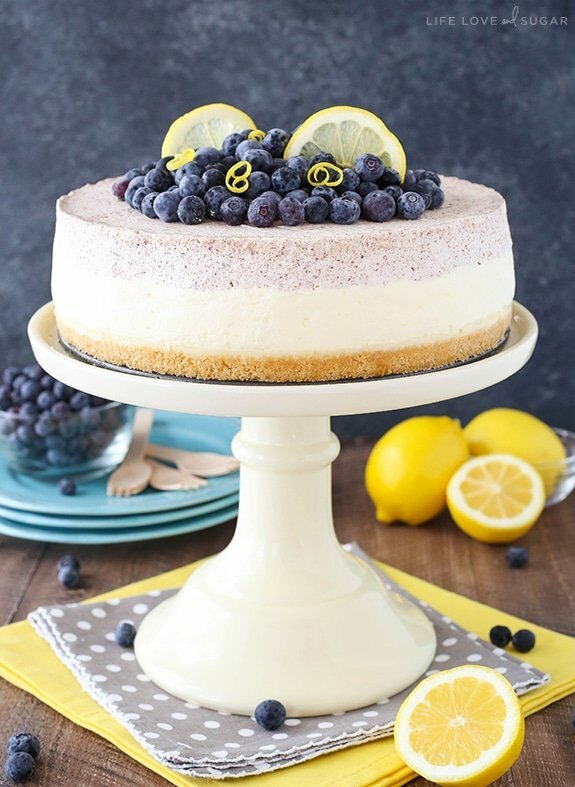 I suggest making the lemon curd and lemon cake layers first, then the frosting and putting it all together. The curd will take some time to cool completely after being made. 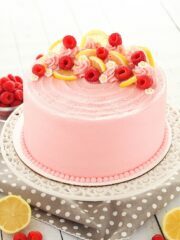 The outside of the cake is covered in more raspberry buttercream for a lovely pink and summery look. I love that all the pink color of the frosting comes just from the raspberry puree in the frosting. And for help with making a smoothly frosted cake, check out my tutorial. This cake is incredibly moist and full of flavor. It’s a wonderful combination of sweet and tangy. I hope you love this cake as much as I do! It’s certainly perfect for spring and summer and great for any occasion. 1. Combine all ingredients in a double boiler and heat while stirring constantly with a whisk. It’s done when it’s thick enough to coat the back of a smooth. 2. Refrigerate lemon curd until cool and thick. 1. Preheat oven to 350 degrees and line three 8 inch cake pans with parchment paper and grease the sides. 2. Beat butter and sugar until light and fluffy, 3-4 minutes. 3. Add vanilla extract, sour cream and lemon zest and mix until combined. 4. 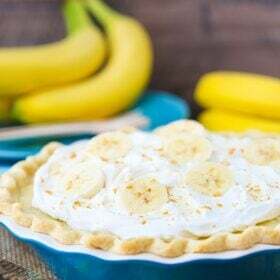 Add egg whites in two batches, scraping down the sides of the bowl as needed to make sure all is incorporated and smooth. 5. In a separate bowl, combine dry ingredients. In another small bowl or measuring cup, combine milk and water. 6. Had half of the dry ingredients to the batter and mix until combined. Add milk/water combination and mix until combined, scraping down the sides of the bowl as needed. Add remaining dry ingredients and mix until smooth. 7. Divide batter evenly between the three 8 inch pans and bake for 23-25 minutes, or until a toothpick inserted comes out with a few crumbs. 1. Puree fresh raspberries, then press through a fine mess sieve to remove pulp and seeds. You should end up with about ½ a cup of raspberry liquid. 2. Combine butter and shortening and beat until smooth. 3. Add 4 cups of powdered sugar and beat until smooth. 4. Add raspberry liquid and beat until well combined. 5. Slowly add remaining powdered sugar, beating until smooth. 6. Add 1 to 2 tablespoons of milk or water, as needed, to thin out the frosting. 1. Remove the tops of the cakes with a large serrated knife, so they are flat. Place first cake on serving plate or on a cardboard cake circle. 2. Top cake with about ¾ cup of raspberry frosting and spread into an even layer. 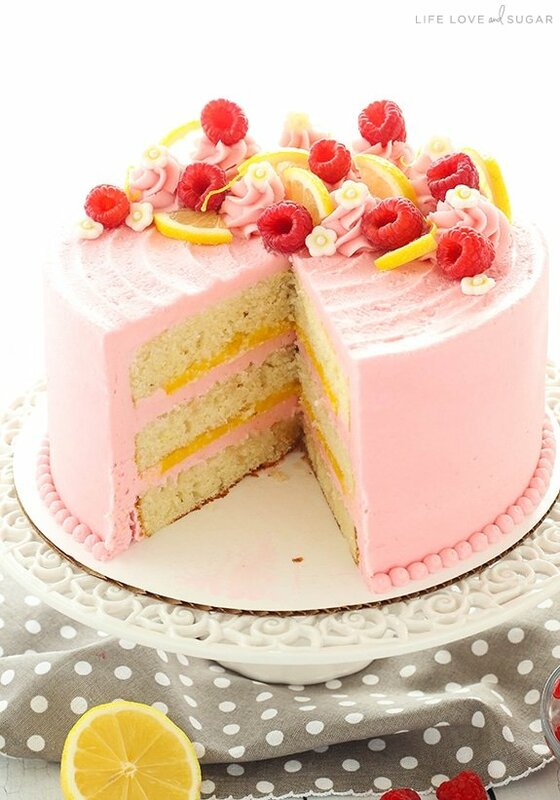 Pipe a dam of raspberry frosting around the outside edge of the cake, then fill it with half of the lemon curd. 3. Top lemon curd with second layer of cake and repeat another layer of raspberry frosting and lemon curd. 4. Add final layer of cake, the frost the outside of the cake with the raspberry frosting. 5. Before the frosting on top of the cake has a chance to firm up too much, use your offset spatula to create the lines on top. Starting from the center, hold the tip of your spatula on the cake at about a 30-45 degree angle. Your cake should be on a turntable so that it’s easy to turn the cake and complete the circle. Make one circle at a time, moving from the center of the cake to the outside. 6. Pipe several tall swirls of frosting on the back half of the top of the cake, leaving some space between for adding lemon slices and raspberries. 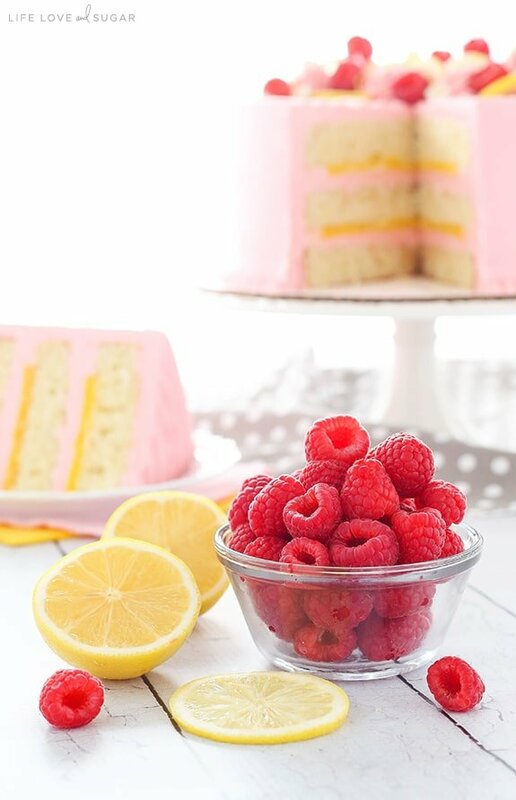 Add lemon slices and raspberries to cake. 7. To make the fondant flowers, use a small blossom cutter. Use a brush to dust a little bit of yellow pearl dust in the center, then add a little bit of sugar water* in the center of the flower and press a small pearl sprinkle into the center. Add flowers to cakes. Cake should be refrigerated until ready to serve. Best served after allowing to sit out for about 30 minutes. * To make the sugar water, add about 2 tbsp of water to a small bowl. Break up a few pieces of fondant and place it into the water. Let it sit for about 10 minutes and dissolve the fondant. It will create a sticky sugar water that will help the sprinkles stick to the center of the flowers. Oh my LORD. Can you please do slow-mo shots of this cake being made? I want to see the top part especially. It’s so gorgeous! Like a summer garden on a cake! If this cake is this tasty as your photographs are beautiful, it must be divine. Wow! Just says summer! Can’t wait to make this one! Thanks Kathy! I hope you get a chance to try it! That cake is gorgeous and looks so scrumptiously delicious! This cake is GORGEOUS! Wow! Raspberries and lemons are a favorite combination of mine, too. How gorgeous! What a picture perfect cake! I just found your blog but I can already say that ALL your cakes are so beautiful !! ( and so tasty lokking) I will definately make some of them, this one especially. Hi! This cake looks LOVELY!! Is it ok to use butter instead of shortening? Where I live it’s hard to come by and imported from the states and kinda expensive. Thanks!! Yes, butter works just fine as a replacement. 🙂 Enjoy! What tip did you use for the dots around the bottom?? I believe it was Wilton 10. This was extremely delicious. Thank you for the recipe. I am going to try it with whipped cream frosting and cupcakes. I hope it turns out as great as the cake, sooo yummy! 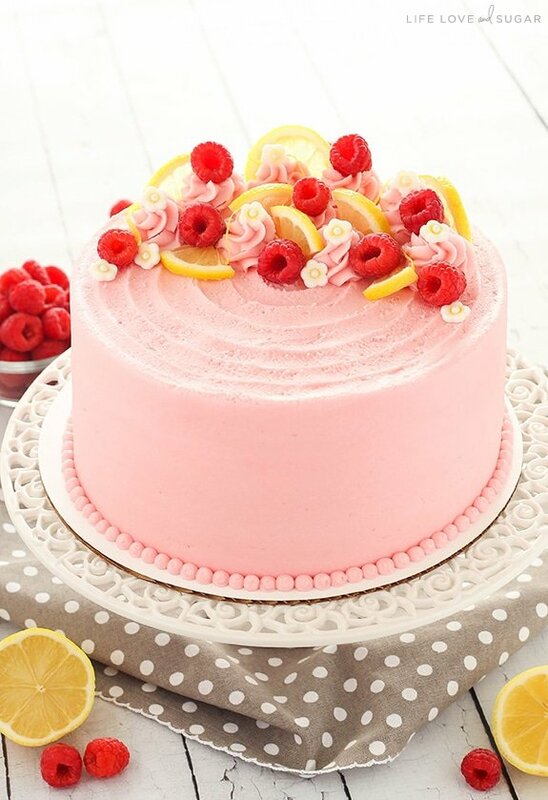 Hi so I am planning on making this cake for y sisters birthday party and I was just wondering if the raspberry frosting is suppose to have 12 cups of confectioners sugar or if its suppose to be 1/2 cups? It’s 12 cups. It’s a decorators buttercream, so it’s fairly thick and much of the volume comes from the powdered sugar. You are welcome to reduce it to your preference though. Hi thanks so much for this amazing recipe! 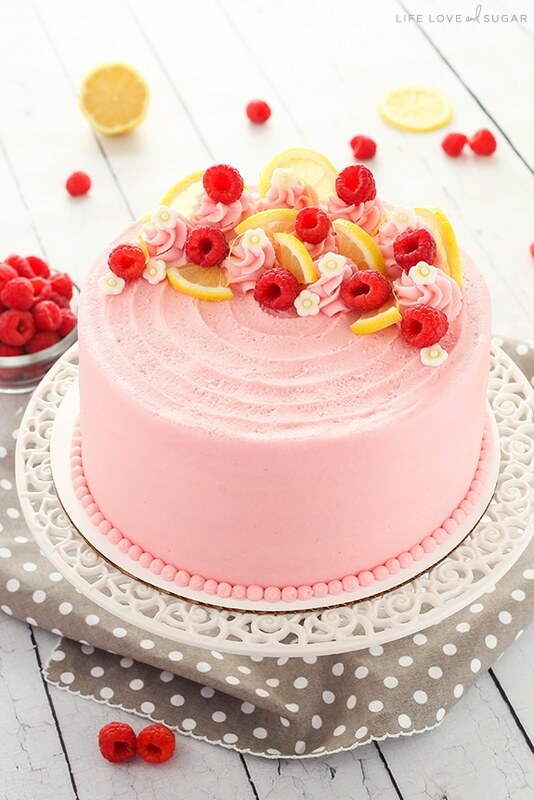 i’m looking to make this recipe for my sisters birthday party and I was wondering if there should 12 cups or 1/2 cups of sugar for the raspberry frosting? Thanks so much! 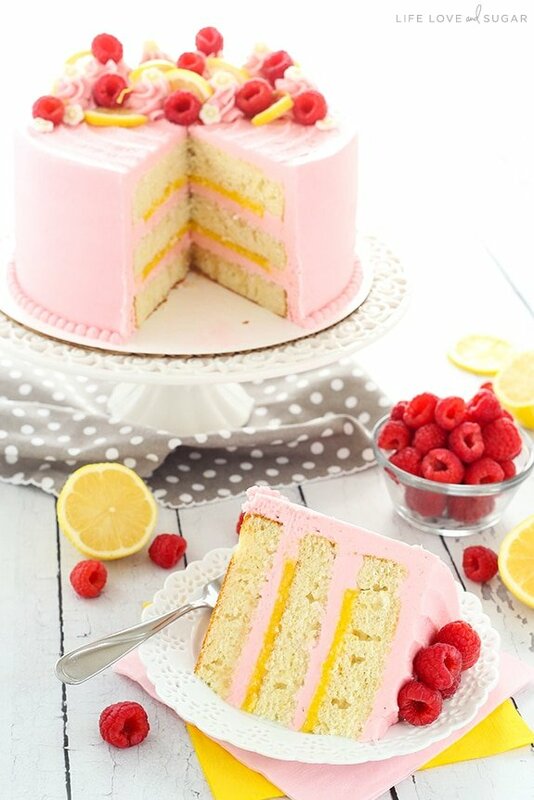 How do you get these beautiful divided layers of buttercream and lemon curd beteeen the layers of cake? 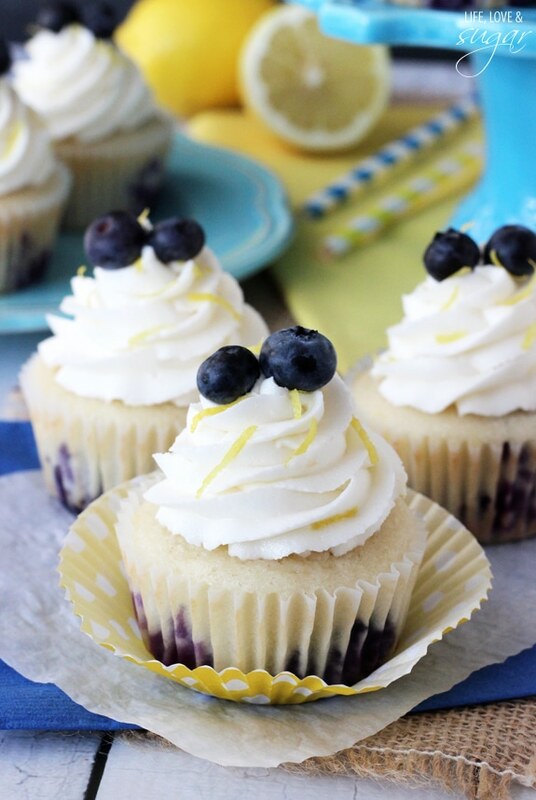 When I use lemon curd or jam it will always combine a little with buttercream, because of the liquid in it. Well I use a fairly thick buttercream. That could have something to do with it. 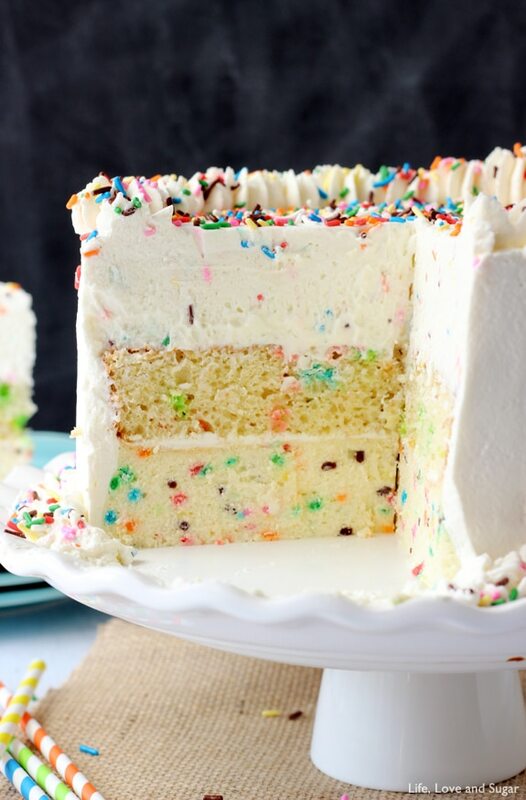 The buttercream layer stays fairly firm. Is the buttercream super sweet? I like the idea of a thick buttercream, but I do not enjoy a sickly sweet frosting. The cake looks delicious and my 10 year old requested it for her birthday this weekend. Thanks! I wouldn’t describe it as sickly sweet, but I’ve had some comment that similar frostings are pretty sweet for them. You can defiantly reduce the amount of powdered sugar, you’ll just have a thinner frosting with less volume. I only have 9 inch pans, would these work? I am concerned that the layers would be too thin, but I don’t really want to go and buy three more pans either. Any suggestions? 9 inch pans should be fine, you’ll just have a shorter cake and want to bake the 3 layers a little less time. You could also just do two layers if you want them a little thicker. The cake was amazing. Thanks! Hey Lindsay, I must say that I love your recipes, I’ve tried the chocolate Oreo cake and it is definitely so delicious. Also, I just wanted to congratulate you on your cookbook- I’ve pre-ordered my copy and I can’t wait to see your lovely recipes. Take care and never stop smiling!! I’m in the middle of making this gorgeous cake for my daughter’s tea-party birthday party tomorrow! However, I just pulled the cake pans out of the oven and after sitting a few minutes, they shriveled and became very dense and flat, almost like pancakes. Do you have an idea why this happened? Is it not beating the egg whites long enough? Ive never had this happen with a cake before and am trying to figure out if I should start all over…or make three more dense cakes for a six-mini-layer cake? I’m just afraid it won’t be cake texture, but more chewy/dense. Would welcome any thoughts to still pull off this beautiful and yummy cake! Sorry for the delay in response, but maybe this will help for the future. That usually happens when the butter and sugar aren’t fully creamed. You really want to be sure to let the mixer go for 3-4 minutes. Hi! I was just wondering if you think this would work at high-altitude and if you had any tips on that front. Thanks! I’m sorry but I don’t have any experience with high altitude baking. 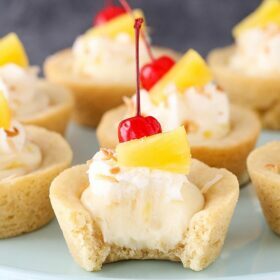 I really wanted to try this recipe but couldn’t find any way to print it. Did I miss something??? There should be a little teal button in the pink recipe card just under the small photo of the recipe. I was wondering the same thing because I couldn’t find the print button either. I refreshed the page and noticed that the video ad, when centered on the page, covers the print button. When I scroll down, the video minimizes a bit and moves off to the side, uncovering it. I realized as well that if you press the “X” to close the video, it does the same thing. Hi, would this cake work well with white fondant underneath the raspberry butter cream? ???? Typically fondant goes on top of the buttercream. I’m not sure about adding it underneath the buttercream. Thank you for all your scrumptious cake recipes! I love the versatility of each cake. I love mixing and matching! I recently made this lemon cake. I used two pans instead of three and made the middle layer your lemon cheesecake. Between the layers I put a blue berry puree (from the berry and marscapone cake recipe). I frosted the cake with your cream cheese whipped cream frosting and garnished it with candied lemon slices and blueberries. It turned out incredible! Your recipes are the garanimals of the cake world! Sounds delicious! Glad you enjoyed it! Thanks Cindy! Hi, do you use 8″x3″ cake pans or 8″x2″? This cake looks so fresh and beautiful. I cant wait to make it! I typically use 8×2 inch pans. So I made this yesterday for my girlfriend’s birthday. I couldn’t of course make it as well as you’ve done here but it turned out very nicely I think so I’d like to thank you very much for the recipe. 1st – 12 cups of icing sugar for the icing seemed a bit much so I used 4 and it worked very well. Is this a typo (the 12 cups) or am I just genuinely lucky that it worked. 2nd – why are measurements quoted by volume instead of weight? I know you guys love the old imperial system (aside from your military because they use metric like the rest of us) but why the volumetric measures? Yay and thanks very much again. The 12 cups of powdered sugar isn’t a typo at all. I wouldn’t say that you are lucky it worked with less, I’d just say you clearly use less frosting than I do. 🙂 Also, I’m sure your frosting was a different consistency than mine as a result. If you’re curious to know more about my frosting and why I use certain amounts of things, check out this post. Ingredients by volume is standard for most home bakers in the U.S. I do include weight measurements with my newer recipes. If you’d like to convert older recipes, please see my conversion chart. This cake looks amazing. I have 2 x 7 inch tins as I would like to make a smaller cake. I would like to do 4 layers though. Is this cake easy enough to torte and layer? Would the measurements be enough for 2 x 7 inch tins? Also, how long will the cake keep before decorating? Thank you. I don’t make many smaller cakes like that, so it’s tough to say. I think it’d be fine, just a taller cake. Should be fine to torte and layer as well. The cakes are usually ok for a couple days before frosting if well covered. 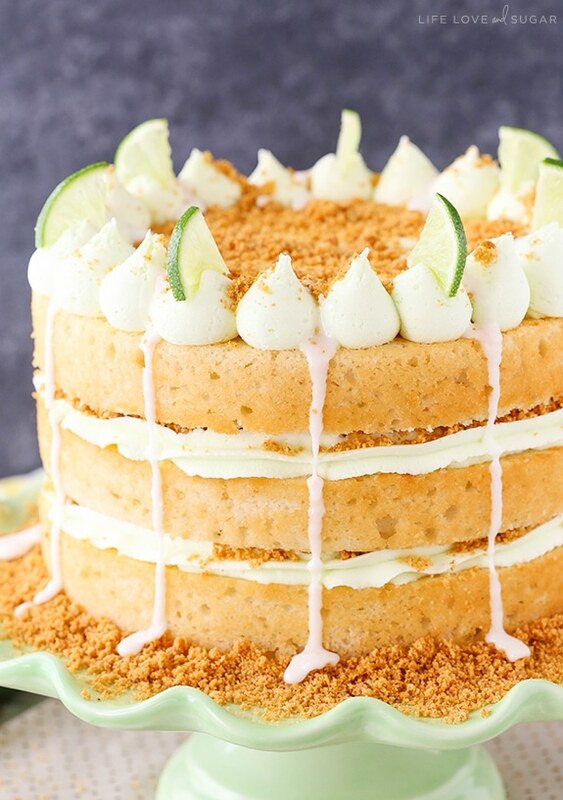 Hi Lindsay I just attempted this recipe and so far my cakes came out great and the lemon curd no problem but as I added the powdered sugar to the buttercream it turned into crumbs! I even checked the comments to see if the 12 cups was a typo and as you clearly say in several comments it is not so how do I fix my buttercream??? When things are added in the order of the instructions, it shouldn’t get that dry. The raspberry puree and water/milk are used to thing it out and keep things the right consistency. Have you added all of that to the frosting already? If so, it sounds like you might need to add a little more. You should be able to save it. Also, check out this post on frosting consistency. I added everything in the order you give. I ended up with a whole cup of the raspberry purée and only used 1/2 like the recipe calls for should I just keep adding liquid until it comes together? Also the post you reference in an earlier comment mentions using 4 cups of powdered sugar why did this cake require so much icing? You could add additional raspberry puree or water/milk. Either would be fine to help it come together. The 4 cups of sugar is for less butter/shortening as well. It’s a standard decorators buttercream – roughly 1 cup of butter/shortening to 4 cups of powdered sugar and then some liquid. The smaller recipe amount is less frosting and the amount I typically use for about 12 cupcakes. I use more frosting on a full cake. Not everyone uses as much frosting as I do though, so you could certainly reduce it. You can see how thick my frosting is in the photos and that’s the amount of frosting listed in the recipe. Hey Lindsay thanks so much! I added the extra liquid and the frosting came together perfect! I can’t wait to put the cake together and present it to my grandma for her birthday!! I made this cake to celebrate my 15 year anniversary with my husband and our two kids. It was a huge hit with the family and surprisingly easy to make. I appreciate the bright and fresh ingredients vs. extracts. One note is that even well decorated I still had a large amount of leftover frosting (and the frosting is amazing!). I would probably cut the recipe by 1/3 in the future. I will absolutely make this cake again. I’m glad you enjoyed it! I’m definitely more heavy handed with frosting than some. 🙂 Happy Anniversary! Hey I would love to try this recipe coz I have tried 2 other recipes of yours and they turned out really good in fact they were awesome and I just can’t wait to try this one too , but for this one I want to know the recipe calls for egg whites I only want to know that the cake would not be eggy at all in taste that’s the only concern .i need to make this day after tomorrow. I’m glad you’ve enjoyed the recipes! The cake should not taste eggy from the egg whites. I hope you enjoy it! Hi. I want to ask you Raspberry Frosting. I don’t have 1 ¼ cups vegetable shortening (not available in Poland). Could you tell me how much more butter should I add. Truly thank you. Just replace it with the same amount of additional butter. Looks amazing, and I’d like to make it for my daughter’s birthday this weekend. Do you think I could make it the day before? We’ll be quite busy the day of. Or if not, then at least make the parts, and just put it together on the day of? Yes, the parts of the cake can definitely be made a day ahead and assembled the day of. I hope you enjoy it! Does the cake mix seperate when adding the sour cream vanilla and lemon zest into the butter and sugar? How thick does each sponge normally come out? Mine are thinner than i expected but I can’t decide if they are supposed to be like that or not and haven’t tasted it yet so I don’t know if it has come out dense. The cake layers should be a little more than an inch, I believe. how much lemon curd does this recipe make? is there a lot of extra left over? It should pretty much all be used in the cake.